SmartFrame smart engineered solutions from Tilling include TECBEAM, a composite structural I-Beam, and TECSLAB, a superior floor solution, both designed to help achieve quality construction with significant time and cost savings. TECBEAM is a composite structural I-Beam featuring a continuous galvanised steel web and timber flanges to create a lightweight beam with structural properties closely resembling those of a steel beam rather than a solid beam. Designed and manufactured in Australia, TECBEAM holds worldwide patents for its technology. TECSLAB’s superior floor solution is recommended for multi-residential apartment buildings class 1, 2, 3, and 9c up to 4 storeys. 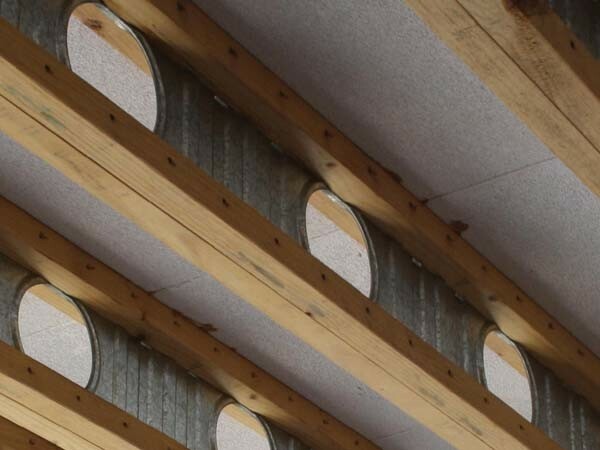 TECSLAB is ideal for long spanning floors in buildings built with load bearing timber or steel framed and timber joist structures including transition floors above car parks. The TECSLAB system delivers multiple benefits to the construction project. For instance, it provides a concrete floor feel with Hebel on a lightweight but strong frame; achieves significant reduction in sound transmission between floors from airborne noise and footfall; offers engineered system stiffness for comfort without the floor 'bounce'; and has an extremely low long term deflection factor, minimising floor movement and creep, with less maintenance issues post construction compared to concrete or timber structures. The TECBEAM joist carries point loads and has high load capacities (up to 10 kPa). TECSLAB can support long spans of up to 7 metres and simplifies the design and construction of cantilevered balconies. Engineered to easily build balcony and wet area set downs, it can provide a flat floor surface ready for floor covering.